Owned by Annika Kowolzkie of Sunny Corner NSW. 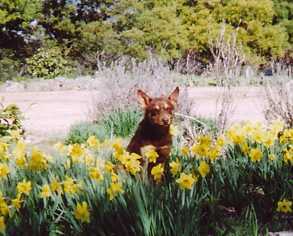 Annika lives on a farm in the Bathurst district if NSW. 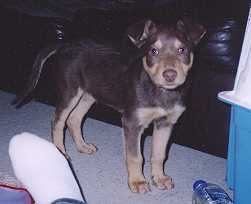 When we first met her she was a young girl with Cancer and her family thought a dog of her own would be good therapy. We are pleased to report that Annika made a full recovery. "Ned is going really well. As you suggested I have been introducing him to lots of new people and some other dogs. I have taken him out to our farm which is 1000 acres. In September we will be shearing out there I'm sure Ned will enjoy that! So far I have taught him to sit, stay, down and he waits till I tell him to eat his food. He still has a little trouble coming when there are distractions such as chooks but I am very pleased with him! 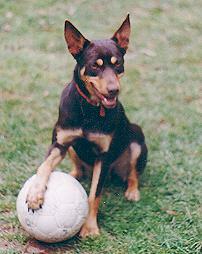 My dad has a male kelpie called Ike who plays with Ned but doesn't let him forget who's the boss! Our family dog Tina and Ned are great friends already. "To Mary and Stephen, Hi this is Annika Kowalski, with Noonbarra Ned. I just thought I'd write and tell you how Ned is progressing. Sorry its taken me so long to write, I've been very busy. Well Ned's got the basic obedience right and has stopped chasing the chooks. He was also looking very good with the sheep. We had to sell the sheep we had here, so he had been working with the sheep on my Nanna's property, just down the road until a fire burnt all the grass, forcing us to sell those sheep as well. So Ned has been having a rather quiet time recently without sheep. On our property near Sofala we had 1000 sheep but with this dry weather we sold half. And because it's over an hours travel, me and Ned don't get out there much. The only stock we have here is around 30 cows and due to the drought we do not have enough feed for any sheep, so Ned is looking forward to the end of drought so we can get some sheep again. I bet its dry at Manildra and I hope the Drought isn't affecting you too badly. " In 2003, Annika wrote this piece for Kelpie News Magazine. 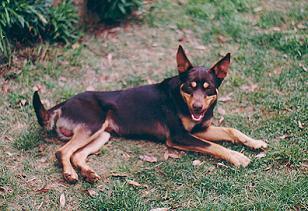 Readers may remember when 15 year old Annika sent in a nice photo of her Kelpie Ned a few issues back. She has now sent us two more photos. Annika has had a tough time with Cancer but is now doing really well. “I purchased Ned from the Noonbarra Stud when he was 8 weeks old. After I had a battle with cancer, Ned helped me back into the swing of things. We live on a small property with cows on it and we also own a property with sheep. Ned can work both the sheep and the cows pretty well." 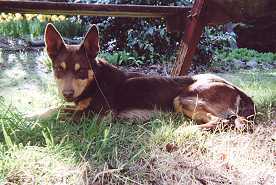 "He picked up the basic obedience quickly as a pup. Ned is a very intelligent dog and doesn’t mind being around crowds. Ned leaves toys around the garden so when we go for walks you can guarantee that he has a huge selection of toys to choose from." "When I tell him to sit, he looks up at me and moves his head from side to side with a questioning look on his face. 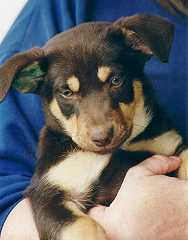 He has a good temperament and is very cute, although he can be a bit frustrating at times. Ned is a great worker, companion and is lots of fun." - Annika Kowalski. 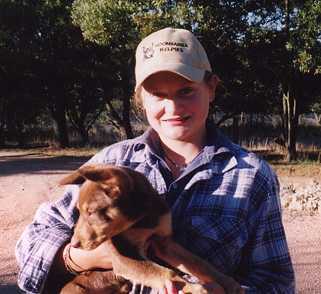 During the drought in January 2004, Annika, her Dad and Noonbarra Ned were out the whole day mustering sheep. It was a very hot and dry. At the end of the day they stopped off at the creek to give Ned a swim. He was bitten by a snake and collapsed as he left the water. He was rushed to the Vets but it was a 45 minute drive. By the time he got there and was given anti-venom it was too late and he passed away. The whole family was deeply saddened by the loss. Annika was completely devastated and her father said she was just moping around looking at photos of Ned. A very sad end to a wonderful dog. Owned by Annika. Sunny Corner (Bathurst District). Some time after Noonbarra Ned was killed by the snake, Annika and family ordered another Noonbarra Kelpie to take on the work. We fast-tracked her order so that she would be able to get a good pup as quickly as possible. Sunny was a stand out pup in our eyes as he reminded us a lot of our top dog, Noonbarra Dusty. He was a faithful type who was a thinker and very friendly. We thought he would be perfect for Annika.
" Sunny is going really well. He is a really friendly boy and loves being around people and other dogs. He has turned into a really nice colour. ... He is excellent with the sheep, with a great deal of natural instinct. He is calm with sheep and uses a good balance of eye. If a sheep breaks away from the group, he casually, but effectively , brings them back to the mob. "He is my best friend and enjoys playing. Yesterday, he was on the back of the Ute. Instead of just jumping off the back of the Ute, he jumped up onto the cab, then slid down the window onto the bonnet, then jumped off the bonnet! It was so funny! "Sunny and I were walking along and we came across a Goanna. sunny didn't know what to do. First he tried to chase it, then he got scared and ran behind me and stood there and barked! - From Annika and Sunny. see that he thinks about everything he does. He is very playful and guards his toys very seriously, including his favourite hamburger!!! He is a very calm and patient sheepdog. I cannot thank you enough for Sunny, he is great. I will send you some photos of us soon.